I sent a couple of parcels to South Africa last year and to my surprise I received back the last parcel I sent in October due to non-delivery. The parcel was returned by the South African postal service via Australia Post. I had mixed reactions when I got the parcel back. One was that the dresses will not find a girl to wear it and the second I was glad that it was actually returned due to non-delivery as I paid about $123.00 for the postage. 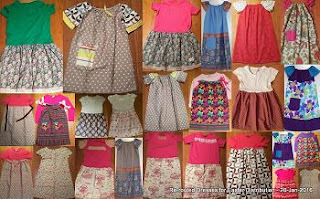 Well, I lost the $123.00 and the time and effort I spent on this parcel but got these dresses back and the donors of these dresses should be happy that their dresses did not go to waste. I will now re-allocate these dresses to Dress Distribution #100 for Easter Distribution in March 2016. I was not in the best of health late last year so I was not able to include them in the Christmas distribution. For individual images and donors of the above dresses, please click here.